George Kittle expects Iowa tight ends Noah Fant and T.J. Hockenson to live up to the hype and make a day-one impact as rookies. The Hawkeye duo are each anticipated to be selected in the first round of the NFL Draft next week after catching the eye at Iowa, a football program that has developed a reputation for producing pro tight ends. Dallas Clark, a Super Bowl champion with the Indianapolis Colts, was a first-round pick out of Iowa and enjoyed 11 seasons in the NFL. Kittle had to wait until the fifth round to hear his name called in 2017, but the San Francisco 49ers star set the single-season record for receiving yards by a tight end last campaign. 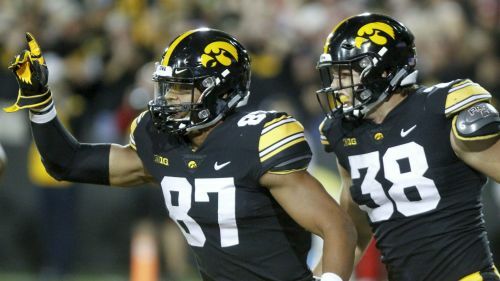 Neither Fant nor Hockenson will have to be that patient, and Kittle has no doubt in their ability to become the latest Hawkeye tight ends to excel in the pros. "I think they're both definitely first-round draft picks, they're both guys that will instantly affect the team positively," Kittle told Omnisport. "Noah is literally the best athlete that I've ever seen, he is absolutely outrageous, I saw that [on] day one as soon as he stepped in the building at Iowa as an 18-year-old freshman, he's an absolute freak. "He makes plays that other people can't physically make, he's unreal quick twitchy, incredibly fast and he's incredibly strong too. I'm pretty sure he has multiple strength records at Iowa, he's not just this skinny, lanky fast kind, he's incredibly strong and powerful. He's gonna be incredible. "Then you've got T.J., who's just 'Mr Do it All', he's like a Swiss Army knife, he can run block, he can go against [defensive] ends, linebackers, safeties it doesn't matter, he just gets it done, catches every ball you throw to him. "He just has a great attitude every single day, I was in the locker room [with them] for only a year but, being able to keep in touch with both those guys since I've graduated, they're both incredibly hard workers and whatever team they get drafted to they're going to impact them in a positive way [from] day one." As for why Iowa consistently produces such great players at the position, Kittle credited veteran strength coach Chris Doyle and an offense and locker room mindset that help make the jump to the NFL less daunting. "They do a really good job in the strength program with Coach Doyle," Kittle added. "He just really takes young guys and builds on their frames and prepares them for the NFL level. The offense that we run is very pro-style and the attitude around the locker room is very football-oriented. Every day you show up and it's football, I think that's a great thing, it gets guys in the right mindset, and it definitely prepares you for the next level." Having flown under the radar two years ago, Kittle accepts his rise to stardom may have helped boost the hype Fant and Hockenson have received. "I think maybe a little bit," he said when asked if he paved the way for them to be first-rounders. "You don't want to sleep on Iowa tight ends because we all have some fun and I think Iowa's put out a lot of good tight ends that have made a lot of big plays and impact a lot of NFL teams. If I'm an NFL GM, coach, I'd definitely want both those guys on my team." Phenomenal play all around as Nate Stanley finds T.J. Hockenson for the @HawkeyeFootball bomb. However, Kittle did not hesitate to reject any notion of him being a better prospect than Fant or Hockenson. "Definitely T.J. and Noah are both higher prospects than I was," he said. "I only had like 40 catches total at Iowa, I think they each had 40 in one year. "They're pretty and they're going to do a lot of really good things. I'm just happy to be in the conversation with those guys because they had a special college career."